This week we’ll be playing Qwixx, Rolling America, and Castles of Burgundy: The Dice Game Roll and Write games on stream this Thursday, 8/9. These games will be fun to stream with Chat and should be highly interactive. It’s interesting to see the complexity of the scorecards grows from game to game. Qwixx rules are very simple and plays rather quickly (Qwixxly? )The goal of the game is to get the most points by crossing off numbers on their scorecard. Face to Face, players take turns rolling 4 colored dice and 2 white dice each turn. All players have a chance to cross off the total of the white dice on one row. Then, the roller may add 1 one die to any of the colored dice and can cross off that number. If the roller does not cross off any numbers, she takes a 5 point penalty. The key wrinkle with crossing off numbers is that you cannot cross off a number to the left of an already crossed off number. Rolled a nice 1 White and 4 Red? You can’t cross off your 5 Red spot if you have already crossed off your Red 6. It’s mostly a game of probability with just a dash of press your luck on how and when to cross off the numbers available. The game ends when one scorecard has 5 Penalities crossed off or 2 rows have been locked. A row can be locked when the Red 2, Yellow 2, Green 12, or Blue 12 are crossed off. They can only be crossed off if 5 other numbers in that row are crossed. When a row is locked, that color die is removed from the game! This will be the only challenging thing to monitor with the Chat. They will have to speak up when they lock a row! On stream, I’ll roll the dice every turn but the “roller” will alternate between me and Chat. It will be interesting to see how diverse the Chat’s scorecards end up! 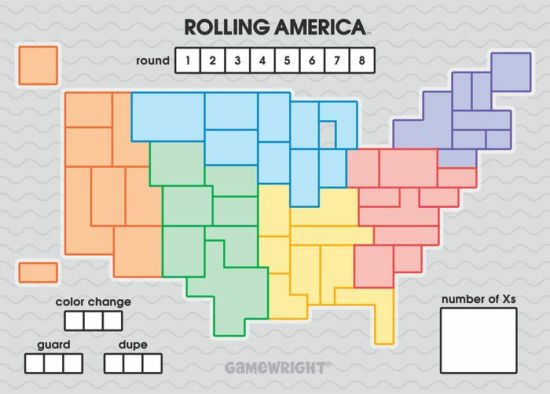 Rolling America adds an interesting spatial element to the roll and write genre. In Rolling America, dice are rolled 2 out of a time. Players write down the number of each colored rolled in the matching region of America. States can only be filled in with a number equal to, or 1 off (larger or smaller) than the number in a neighboring state. The color doesn’t matter for this placement rule. Players have a few ways to mitigate dice rolls. You can change the color rolled 3 times, you can duplicate a roll 3 times, and you can guard a die 3 times. Guarding eliminates the neighboring states rule. The game lasts 8 rounds, and 1 round ends when 6 of the 7 dice have been rolled. If a number can’t be written down, an X is placed instead. The player with the fewest Xs wins! Castles of Burgundy: The Dice Game explodes with interesting decisions tied to every die roll. 5 dice are rolled every turn, 2 colored dice, 2 numbered dice, and 1 “time” die. The time die has 1 or 2 hourglasses and controls how long the game lasts. 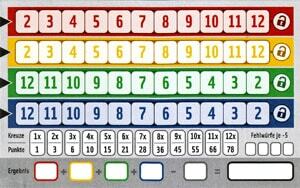 Players pick 1 color and 1 number combination to write on your board. There are a ton of restrictions on how and when you can write your number. But, you also have a ton of options to change the rolls. Filling in all the colors in one area grants you a special power to aid in your placements. Just like in the board game, there is a race to fill in areas as quickly as possible for bigger points. Do you try to gain large points quickly or play to get as many options as you can? It’s a great dynamic for a dice game! You can find more game information on the Castles of Burgundy: The Dice Game page. In order to play along with any of these games, you’ll need your very own personal score card. If you own the games, tear off a page and join in! 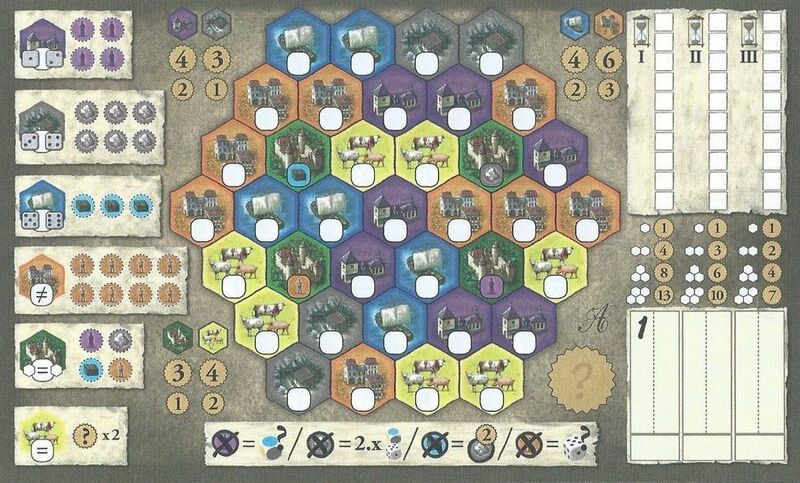 The scorecard for Qwixx and an abstract Castles of Burgundy scorecard are on Board Game Geek. You’re on your own for Rolling America! I hope you join me and have fun playing along or just watching!